During the 20th century the development of clinical allergy was a piecemeal process during which the allergists of the time made great efforts to identify the causes of their patient’s problems, as there were no really effective drugs until around 1950. Crude allergen extracts provided a means of diagnosis by skin testing, and also treatment by desensitisation. Allergy was a mysterious and often frustrating problem, and close attention to the case histories of the patients was often the only way to reach a diagnosis. A tremendous amount of clinical research took place between the wars, mainly in the USA. The top allergists, many of whom I have had the privilege to meet, became very skilled in identifying the causes of their patients sufferings, often including eczema. The published research in the American journals in the thirties and forties makes fascinating reading, but now gathers dust in the basement of the Library of the Royal Society of Medicine. The introduction of corticosteroids and antihistamine drugs from 1950 onwards revolutionised the treatment of allergies and many other diseases, but the side-effects soon became evident. For the first time symptoms of allergic disease could be suppressed no matter what the cause might be, making it less important to discover and if possible eliminate the cause of the allergy. It has been said, with some truth, that steroid creams were so effective that there was no longer much incentive for dermatologists to think about what was causing the eczema. On the other hand it is also obvious that had it not been for the development of effective and powerful drugs for asthma in the last fifty years the current allergy epidemic would have been a national emergency with many deaths. In the last fifty years the scientific study of allergic reactions in laboratory animals and in man, and the identification of mediator chemicals, has made tremendous strides in explaining what happens when an allergic reaction takes place. These scientific developments have involved very advanced techniques in immunology, biochemistry, genetics, and many other scientific disciplines. Although most scientists involved in allergy research do not have medical qualifications, their discoveries may have considerable impact on clinical practice. A great deal of this fundamental research is supported by the pharmaceutical industry because the discovery of new and effective drugs can be very profitable. The development of many scientific tests in the last fifty years has been phenomenal, but can be abused by ordering a battery of tests hoping the answer will turn up. Also it is tempting to ask for another test to exclude some remote possibility, thus enabling a decision to be deferred until the result has been received. I think that the introduction of more and more laboratory tests into medical practice can result in undue reliance on tests at the expense of the interactive cooperation with the patient which is so essential in solving allergic problems. In the final analysis the establishment of a good old-fashioned doctor/patient relationship is essential, and it is the doctor who has to assess the significance of the test results. Although much more science is involved in medical practice today, the art of medicine is still of paramount importance when treating and investigating allergic patients. I feel strongly that we may not always take full advantage of the fact that, unlike laboratory animals, patients can tell us how they feel, keep records, give a detailed history, ask questions, record their symptoms and be willing partners in clinical research. When I achieved my first medical qualification there were so few really effective drugs that I have difficulty in remembering more than ten. 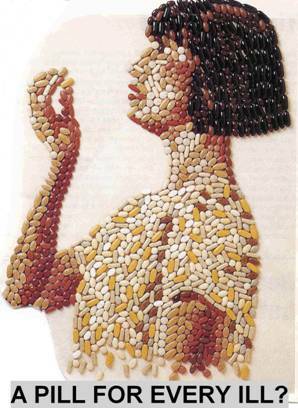 Today we are spoiled for choice, as dramatically illustrated by this picture of a lady made up entirely from tablets, coloured with dyes which sometimes cause allergic reactions. Nowadays patients usually go to the doctor seeking a pill to relieve symptoms. Perhaps the doctor’s hidden employer has become the pharmaceutical industry, as our dependence on medication, especially for allergies, is nearly total. Is 'joined-up' medicine no more? Patients often complain that they seldom see the same doctor twice nowadays, but the NHS administration will be satisfied as long as they are seen by a properly qualified person, who may have neither the time nor the inclination to read the thick notes of a chronic case if they are unlikely to see them again. At hospital out-patients too the chronic patient may be seen by a junior doctor in a short-term job who will read only the last report, make no change in treatment unless necessary, and make another appointment which will probably be after he or she has gone elsewhere. Thus the notes get thicker and thicker, the patients get a poor service, and they will seldom be discharged from the clinic. In my opinion continuity of care is very important for the doctor as well as for the patient in the management of any chronic problem,. Consulting the same doctor every time facilitates the establishment of a personal relationship and respect, and also makes medical practice more satisfying and interesting for the doctor as well as the patient. This ideal situation may be difficult to establish in a modern medical centre which has succeeded the old family doctor who often knew his patients personally from cradle to grave. The impersonal type of practice of today must tend to be as boring for the doctor as it is unsatisfactory for the patient. Over the last fifty years phenomenal developments in medicine and in surgery have saved many patients who would otherwise have died. Their continued survival is dependent on new drugs and innovative new techniques, thus creating a requirement for more and more specialised doctors and other health professionals to care for them, and an increased burden on the health services. The growth of special interests in one part of the body could be said to resemble a group of children who have each taken over a piece of the family business, and expanded and developed it to a variable extent. They soon develop their own jargon, so they have difficulty in understanding one another, and they scrabble for their share of resources for more development. Today the ‘jack of all trades’ general physician or surgeon has all but disappeared, and the barriers between the specialities become ever higher. The family doctor may be the only surviving general physician dealing with all sorts of problems, but the allergist also has general interests which ignore these barriers. For specialities where other organ systems are seldom involved specialisation is excellent, but allergy can affect any part of the body, encroaching on dermatology, ear nose and throat, respiratory medicine, gastroenterology, paediatrics, etc. etc. The development of the specialities and the decline of the generalist has led to more frequent cross referrals from one specialist department to another. Many consultants are unaware of the wide scope of allergic diseases and their potential to involve any one or even several organ systems, and in the UK it is most unusual for there to be an allergy department to which patients can be referred for advice. Since the inception of the NHS in 1948 every other medical speciality has flourished and expanded, while clinical allergy has failed to become established as a major speciality, and almost disappeared a few years ago The primary reason is the lack of even elementary instruction regarding allergy in most medical schools, plus the fact that since 1948 not one of the physicians who had a special interest in allergy were replaced on retirement by anyone with the same interests, including myself. I consider myself most fortunate to have served the British National Health Service when it was possible to take an initiative without bureaucratic interference, and to have a happy research collaboration with many allergic patients. They helped me and taught me a great deal, and all I have done is tried to make sense of what they told me, sometimes discovered the reason for their problems, and sometimes actually effected a cure. The increasing allergy problem was belatedly recognised by the Royal College of Physicians, who laid down the training requirements for allergists, established a code of best allergy practice, and finally published a report entitled the “Unmet Need” for an allergy service in 2003. The initial response to this report by the Ministry of Health was to state that the NHS is coping “reasonably well” and that there was no evidence of this “unmet need”. This response really meant that because there was no allergy service to which patients could be referred, there was no demand for an allergy service!!! Increasing pressure from the Royal College, allergy charities, and the public intensified, eventually resulting in an enquiry by the House of Commons Select Committee on Health in 2004. 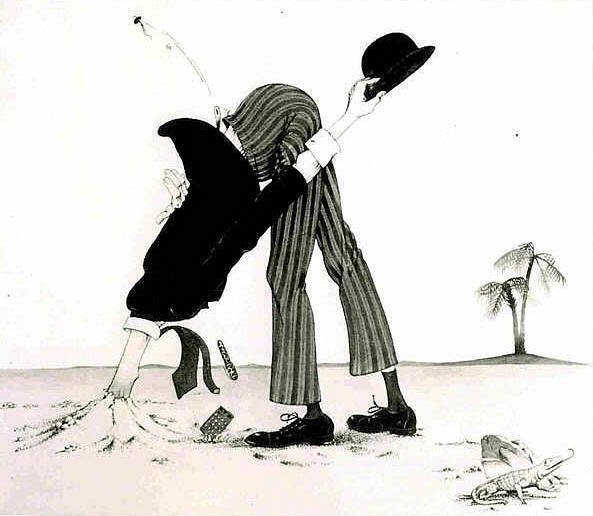 Practically all the recommendations of the Health Committee were accepted by the Government, giving the impression that things were really going to happen at last, although there are so few specialist registrars on a five year training course that there was clearly no way that twenty new consultants could be found unless they were to be imported from overseas. On closer reading, however, the Governmental response consists of fourteen pages of masterly obfuscation worthy of Sir Humphry in “Yes Minister” which ended by asking for reviews of “ all the available data and research on the epidemiology of allergic conditions.” This will ensure a delay of many years before any action has to be taken, and completely ignored the fact that adequate published evidence is already available from research carried out in the UK and in Europe which formed the basis of the Royal College of Physicians Report. Since then there has been another House of Commons Committee and one from the House of Lords, but apart from the appointment of a few consultant allergists nothing has transpired. “The responsibilities for local health services are now firmly in the hands of the Primary Care Trusts, including the needs for the allergy services”. It would be very surprising if more than a few medical advisers to the PCTs know anything about allergy, or appreciate the the impact of chronic allergy on the health and quality of life of millions of sufferers. The change of government means that a new set of politicians have to be indoctrinated regarding of the severity of the allergy problem, and stimulated to do something about it. In recent years the British Society for Allergy and Clinical Immunology (BSACI) has been exerting increasing pressure on the Ministry of Health, where the officials do not change, and appear not to realise the seriousness of the problem. It is very unlikely that medically qualified administrators in the Ministry of Health have knowledge of allergies or any appreciation of the effects of chronic allergic diseases on quality of life, employment, and education. To stimulate awareness in the House of Commons the ‘National Allergy Strategy Group’ has been organised to link patients, doctors, and politicians , and held a reception at the House of Commons last December. There is also a Primary Care Committee and a Nurses in Allergy Group, and pressure on NICE recently resulted in publication of a Food Allergy Guideline for all doctors . Six new consultant allergists were appointed in the last year, as a result of previous representations, and the new Evalina Hospital for paediatric allergy is flourishing .
. The proposed health bill has led to chaos in the NHS. The suggestion that general practitioners are placed at the top of the NHS tree instead of the bottom could be very encouraging but for the fact that knowledge of the allergy problem is uncommon. A practical solution which I have been proposing for years without success, is that allergy could be a satisfying sub-speciality for one member of today’s large medical practices to choose. In the past I have personally proved that with some basic training for practitioners it is quite possible to deal effectively with most allergic problems in primary care,. This would be the most rapid and effective way to cope with the “unmet need”, leaving the difficult problems for the true specialist allergists.. But it is going to take much time to build a comprehensive allergy service within the NHS. Perhaps there will be a good service in about twenty-five years time? In conclusion I would like to acknowledge the kindness of my good friend Dr Bill Frankland, the doyen of British clinical allergy, who survived a Japanese POW camp and is now in his 99th year. He has read my manuscript critically, corrected errors, and in many ways encouraged the birth of my website. Dr. Frankland succeeded John Freeman, who first used desensitisation in 1911, as consultant in charge of the Allergy Department at St. Mary’s Hospital, Paddington, subsequently at Guy’s Hospital, and now the London Allergy Clinic.